The inspired cooks of the Himalaya are the Tibetans, not the Nepali. 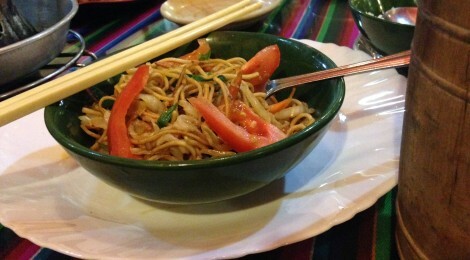 We started sampling Tibetan cuisine in Darjeeling and it quickly became a habit. With a high, arid landscape as an ancestral home, the Tibetans—whom it’s easy to talk about as a single people thanks to the Chinese invasion in 1959, but in fact have several ethnic and language groups—make hearty chow, great comfort food when temperatures drop. So the next time you find yourself in Dharan, Dharmsala, Darjeeling, or DC (there’s a big Tibetan expatriate community in the US capital), you’ll have some other-side-of-the-world menu mastery. Tibetans are wizards of noodle soup. Our favorite among the handful of types is thenthuk, which stars a wide, hand-pulled noodle of wheat flour. Depending on the locale and clientele, restaurants will serve thenthuk with just vegetables, or with chicken, or with water buffalo. We strongly suspect the broth will always have a base that stars an animal bone or two, but we haven’t snuck into the kitchen to check it out. We would be remiss if we didn’t mention the lovely little momo, the Tibetan dumpling. The momo from Utse in Kathmandu. These were a course in our best meal in Nepal. At the time of this writing, the fate of Utse and her people is unknown. Click the picture to enlarge their outstanding cooking. 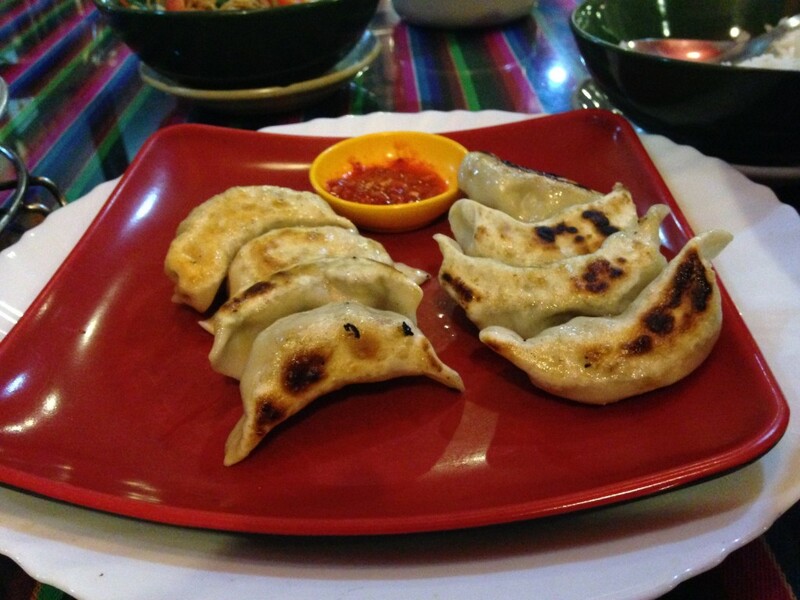 What makes them different than Chinese dumplings you may have experienced? None of the momo we had contained ginger (unless perhaps they were localized for the Indian palette). The momo we had contained yellow, white, or purple onion (shallots, too, probably), not green onion. In the Kathmandu Valley (and in India, not surprisingly) cooks have started a new tradition of stuffing momo dough with a potato mixture. The result is somewhat like a Polish pierogi. A delightful innovation! Can you get Chinese dumplings stuffed with ground yak? Probably now, but I bet they arose only after 1959. I suspect yak momo are a central Asian tradition, not one from eastern Asia. Our favorite method for cooking momo is kothey, meaning pan fried, but steamed and deep fried are also common preparations. Alison sips jaand from a tongba at Yak Restaurant in Kathmandu. This tongba is served in a blue plastic bowl to reduce drips and spills, which are common because Tibetan etiquette says a host should keep their guests drink brimming full. This goes for butter tea as well as jaand. At the time of this writing, the fate of Yak Restaurant and her people are unknown. The the picture to enlarge. A number of menus highlight tongba as “nectar of the gods.” I am not being factious when I agree. Many menus say tongba, but we’re really talking about jaand, a beverage formed by fermenting millet seeds (the yeast comes from an external source called murcha). The alcoholic seeds are scooped into a tall bamboo grail, called a tongba, and then covered with scalding hot water. The alcohol and flavors are steeped out of the seeds and into the water. A tongba full of jaand is a wondrous cross between sake, tea, and beer. The liquid is a pearly, milky white color like nigori sake. It has an ethereal headiness you may have experienced with warm sake or a hot toddy (or a brilliant cup of tea). The flavor is more floral and tart than sake. There is no carbonation, but the alcohol content is similar to beer. When served, the beverage comes with an extra beaker of hot water. There’s plenty of flavor to release with more steeping, and the flavor takes on darker, earthier notes as you sip and pour, sip and pour. 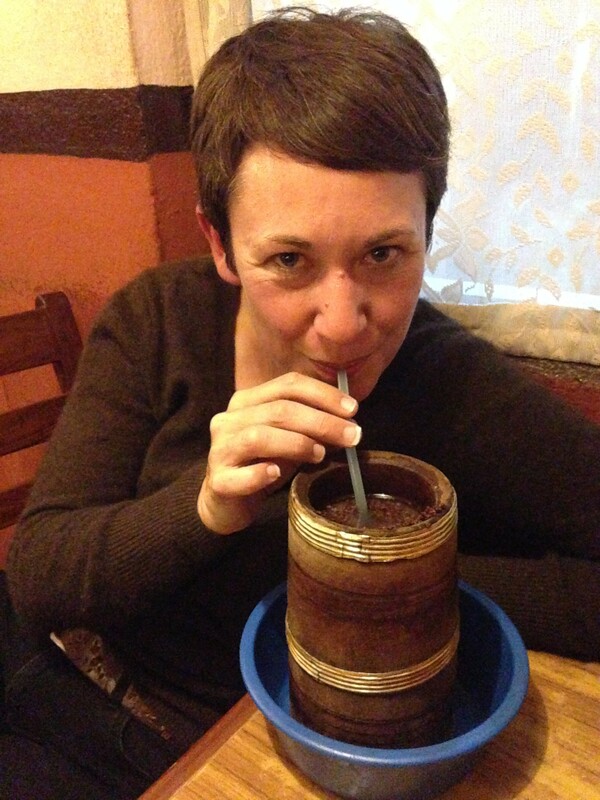 Traditionally, jaand is sipped from its tongba through a bamboo straw. These old-style straws use holes in the side of the straw to minimize how many millet seeds you end up eating. Modern aluminum or plastic straws have a crimped end that helps filter the larger particles. I cannot stress enough: jaand is a fantastic beverage. If you get the chance, don’t hesitate to try it. 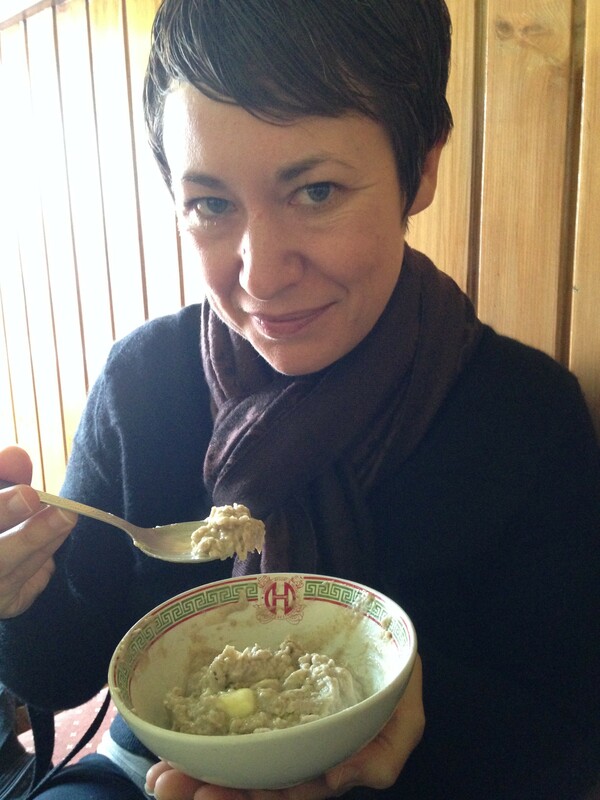 Alison eats her ‘Tibetan porridge’ made primarily of pa. You can see one of the pats of butter eaters are supposed to stir in. Click the photo to enlarge. You know you’re a real traveler when you eat tsampa as pa. The first English translation we saw of this staple was ‘Tibetan Porridge,’ which is literally true (ours was served with hot milk to mix in) but that translation doesn’t capture the simplicity or unique flavor of this dish. 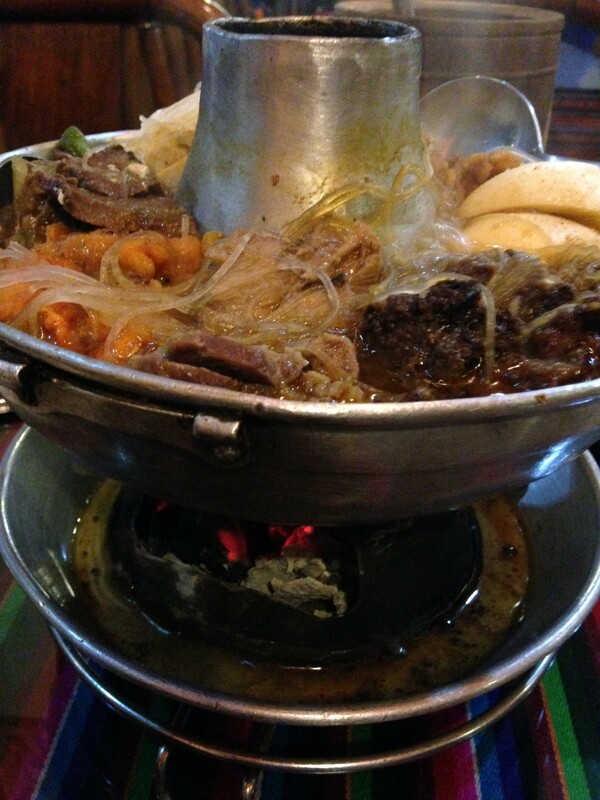 Rumor has it pa is still a three-meal-a-day staple in central Tibet. We give extra credit to Kunga in Darjeeling for having pa on their menu. We can’t recommend pa without giving the nod to po cha, butter tea. City-centric tourists like us had to search harder in Nepal for find this beverage, and we give credit to Utse in Kathmandu for offering it. This non-alcoholic drink is nearly as simple as it sounds. Water and tea leaves are boiled, then salt and butter are churned in. Alison is big fan of salty drinks, hot or cold, and really enjoyed her butter tea. Interestingly, I am a big fan of salty sauces and gravies, but not an equal fan of salty drinks, including butter tea and Gatorade. We’re curious about when real Tibetans serve gyakok, but you are likely to see it on Tibetan restaurant menus as a top-of-the-chart offering. We loved the experience so much we splurged twice for gyakok. Remember how Tibetans are masters of soup? A charcoal brazier is brought to the table, and a donut-shaped tureen is kept simmering on the brazier. Inside the tureen are host of treats: a delicious broth, chunks of different meats, vegetables like carrot and onion, various dumplings, and skinny noodles call phing. The loaded gyakok from Utse in Kathmandu. You can see the glow of the charcoal at the bottom of the contraption. Clockwise from right are two boiled eggs, water buffalo or yak meatballs, slices of sausage, and dumplings. All are resting in a bed of broth and bean thread noodles. Next to the brazier we received a chili-coated potato salad, momo, rice, and a cold noodle-and-vegetable salad ideally suited to the Tibetan condiment of thin-sliced garlic suspended in vinegar. We drank jaand during the meal and finished off with a splendid jasmine tea. I learned “yum” from Chris at UR. It is a complete sentence and an amazingly simple yet complete description of taste. I find myself still using it some 30 years hence…especially when sampling something delightful for the first time. Thanks for the phrase! We’re happy to enrich people’s vocabularies. And we’re happy that you’re enjoying the articles about Nepal and thinking about the tragedy. Writing meaningfully and tastefully about Nepal since the earthquake has been rewarding, hard work. We were glad to do it, and some of the things we’re not doing–we’re not publishing any pictures of Dolphy in Nepal, for example–have an appropriate, bittersweet edge to them.